Teenagers Could Become Prematurely Hearing-Impaired. Today's teenagers could become prematurely hearing-impaired, study warns. Teenagers are increasingly experiencing tinnitus, often a symptom of hearing loss, as a result of using ear buds to listen to music for long periods every day, as well as frequenting very noisy places like nightclubs, discos and rock concerts, according to a study performed in Brazil. Tinnitus is the medical term for perception of sound that has no external source. Many sufferers describe it as a ringing in the ears, others as whistling, buzzing, chirping or hissing. A paper describing the study has just been published in Scientific Reports, an online journal published by Springer Nature. "We found a very high prevalence of tinnitus among adolescents, and this should be seen as an early warning that these youngsters run a serious risk of hearing loss. If this teen generation continue to expose themselves to very high noise levels, they'll probably suffer from hearing loss by the time they're 30 or 40," said Tanit Ganz Sanchez, associate professor of otolaryngology at the University of São Paulo's Medical School (FM-USP) and principal investigator for the study. The researchers used an otoscope to examine the ears of 170 students between 11 and 17 years old. They also asked the teenagers to complete a questionnaire asking whether they had experienced tinnitus in the previous 12 months and, if so, with what volume, duration and frequency. Over half (54.7%) reported a prior experience of tinnitus. "This level of prevalence is alarming," Sanchez said. "There was a notion that tinnitus was a problem of older people, but we're seeing it becoming more prevalent in younger groups, including children and teenagers, because of their increasing exposure to high levels of noise, among other factors." The adolescents who reported prior tinnitus were submitted to psychoacoustic examination to assess hearing function. Administered by an audiologist in an acoustic chamber, the examination measured hearing thresholds using an audiometer at 14?frequencies (0.25-16?kHz), as well as loudness discomfort and the intensity of any tinnitus experienced. During the psychoacoustic measurements, 28.8% of the total sample (49 out of 170) perceived tinnitus in the acoustic booth. The psychoacoustic properties of tinnitus measured in the sound booth corresponded with those of chronic tinnitus in adults. "We found that adolescents perceive tinnitus very often but unlike adults don't worry about it and don't complain to parents or teachers, for example. As a result, they aren't seen by a doctor or hearing specialist, and the problem can become chronic," Sanchez said. The researchers also observed that most of the teenagers who took part in the study reported risky listening habits, such as continuous use of ear buds and exposure to very noisy environments; even so, those who reported experiencing tinnitus displayed less tolerance of loud sounds. Of the 93 school students who reported tinnitus in the last 12 months (54.7% of the total sample), 51 (54.8% of this group) said they had noticed it after listening to loud music. "If the ears of teenagers with tinnitus are more sensitive to high levels of sound than those without, it's natural to expect them to suffer from hearing loss sooner. The tinnitus is an early sign of this impairment that appears well before any actual hearing loss," Sanchez said. 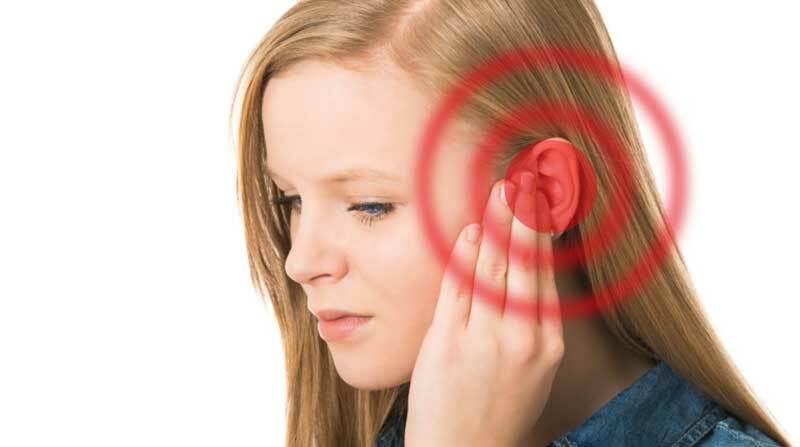 Tinnitus is caused by temporary or permanent damage to cochlear hair cells. Located in the inner ear (cochlea), these cells stretch and contract repeatedly in response to sound-induced vibrations. When they are stimulated by very loud noise, such as explosions, fireworks, live pop music, or music listened to through ear buds with the sound turned up, the cochlear hair cells are overloaded and can be temporarily or permanently damaged. Neighboring regions of the inner ear must work harder and faster to compensate for the loss of function in damaged or dead hair cells, giving rise to tinnitus, Sanchez explained. The results of recent animal experiments conducted by neuroscientists suggest that tinnitus can also be due to impairment of hair cell synapses (neural pathways) to the cochlear nerve, resulting in reduced neural output from the ear to the brain. Damage to these synapses due to exposure to high levels of noise can cause not only hearing loss but also neural alterations in auditory pathways that reduce a teenager's sound level tolerance. "The tinnitus and reduced sound level tolerance observed in the adolescents who took part in the study may be a sign of damage to hair cell synapses that isn't detected by an audiometric examination," Sanchez said. "For this reason, it may appear to be the case that there's no damage to the auditory pathway, but actually the damage doesn't show up in the audiometric data and this makes diagnosis difficult." If these teenagers continue to use ear buds frequently and are exposed to very noisy environments until age 20 or 25, for example, the damage to their cochlear hair cell synapses will progress and they may become deaf while still relatively young, according to Sanchez.